Home / Blog / SUP Road Trip: Just do it! SUP Road Trip: Just do it! When I set out on my SUP Road trip back in May 2016, I didn’t realise how much interest it would create. Like most people I have a full-time job, financial constraints and couldn’t afford to go on a “proper” holiday, so this was the next best thing. Needless to say, I absolutely loved my road trip and can’t wait to do it all over again. If you’re a passionate SUP-nut like me, it’s a great economical way to do some exploring, paddling and getting to know our amazing state of Western Australia a little more intimately. I really want to put it out there that this trip was easy, safe and relatively inexpensive. WA has so many options that you can customise your trip to suit your budget, time frames and preference of getting amongst it all or feeling at one with nature. In this instance, I chose to feel at one with nature and stayed away from the wineries and touristy options. One of the things that impressed me the most was how clean and well facilitated the caravan parks were throughout the South West and inland. The camp kitchens are very well equipped with BBQ cook tops, fridges, washing up stations and dining areas, which can cater for larger groups. The ablutions were more than adequate, being regularly cleaned and having piping hot water. Although they were all different, they all had something great to offer, whether it was the best camp, kitchen, or view! To keep costs right down, I decided to sleep in the back of my X-TRAIL. If you don’t have someone to share the costs with, accommodation such as bungalows and chalets can be expensive and this is one area that is not catered to single travellers very well. In saying that, I was comfortable and had a set routine each morning and night. I had a mattress cut to size and a friend made some curtains for the windows so it was transformed into a clean, cosy, well organised mobile home. The internet is available just about everywhere. I’m not tech savvy at all and I got a great tip about the ‘personal hot spot’ feature on my iPhone so I just plugged it into the computer which enabled me to access Wi-Fi and post on SUP Tonic Australia each night. Friends and family knew I was safe and well at the end of each day and the camp sites are all powered so I never had a problem with devices going flat. I was often asked if I ever got lonely or scared being on my own, and in all honesty, no, I did not. You do need to keep your wits about you, and it helps if you know how to change a tyre, however, I was busy and on a mission which enabled me to be at peace on my own. Comfortable. Safe. If you are travelling alone, it is always a good idea to let someone know where you are whilst ensuring you have plenty of water and snacks. Make sure fuel is always topped up, ensure your first aid kit is stocked and keep your phone charged for peace of mind so you can get on with it and enjoy. What I LOVED was thinking that I was the first person to discover something. At times there was not another soul around, and as I’m a bit of a gypsy at heart, going down a track and seeing where I might end up was really exciting. That’s the beauty of a road trip. Not having a set itinerary and having the freedom to make the difficult decision of whether to turn left or right! There was not a single destination that I didn’t love and the further South I travelled, the better it seemed to get. While I didn’t have a favourite spot as such, Lake Jasper was an awesome find on my way to Walpole and I definitely want to go back there and stop for a night. It was more about the journey and turning off at a rustic sign post on a dirt track that never seemed to end. The reward was arriving at this pristine body of water and deserted sandy beach! Little did I know that this is a popular camping site – and I can see why! Try to keep your trip as simple and as unencumbered as possible. Having too much stuff can be claustrophobic, especially if you are sleeping in your car. The camp kitchens are so good that you don’t need camp stoves and you can buy fresh food just about everywhere. I always pack way too many clothes (it’s a female thing) so be brave and take out half of what you have just packed! Do a practice run of packing the car and work out where you can store stuff. It’s a good idea to make a list in advance as you will find that this will change as you get closer to taking off. After the success of this last trip, I am already planning the next one. This time I will revisit the Collie region (inland) and head to Wellington Dam and the Ferguson Valley over the Christmas period. I’m particularly excited about this one because of the contrasting scenery and landscape within the same region. So I’ll be strapping on the SUP and getting ready for some more exploring. 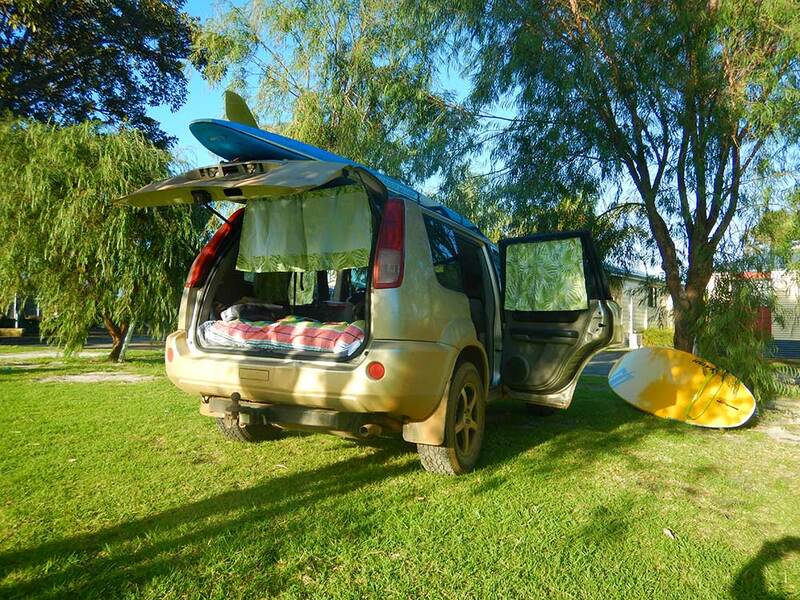 My summary above has hopefully inspired you to pack up the car and go on a SUP road adventure along our glorious coastline. If you do end up heading out, I welcome you to share your experience on our SUP Tonic Australia Facebook Group.